Pretty much anything that’s close to its use-by date can be transformed under the guise of a Spanish omelette. You can include cooked potatoes, cooked vegetables such as peas, leeks, carrots, courgettes, onions etc, that last rasher of bacon and cheese that’s going hard around the edges. 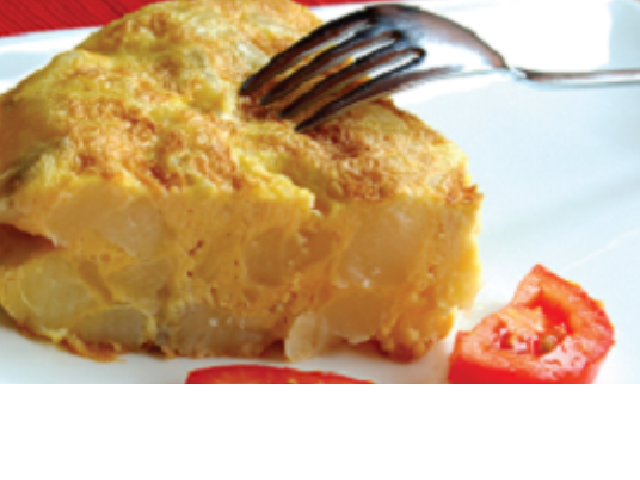 Note: Spanish omelette has a tendency to catch on the pan if you are not careful, so don’t be tempted to use a high heat and use a non-stick or well seasoned frying pan. Break the eggs into a bowl and beat together with the milk, salt and pepper. Heat the oil in a deep non-stick frying pan over a medium heat and add the onions. Fry them until they’re golden brown and softened a bit. If you are also using meat, add this to the pan now and fry for a few minutes. Chop the leftover potatoes and put them into the pan (stirring all the time) and then add the cooked vegetables. Add the egg mixture to the pan, then sprinkle the grated cheese on top. Lower the heat and cover the pan with a lid. Cook for about 12 minutes (until the egg has set) then cut it into wedges and serve while it’s hot!